As many families already know, since January 23, 2007, the Western Hemisphere Travel Initiative (WHTI) has required all U.S.
As many families already know, since January 23, 2007, the Western Hemisphere Travel Initiative (WHTI) has required all U.S. citizens, of any age, traveling by air between the U.S. and Canada, Mexico, Central and South America, the Caribbean, and Bermuda to reenter the U.S. with a Biometric Electronic passport, Air NEXUS card, or U.S. Coast Guard Merchant Mariner Document. The rules changed again in June 2009, when new land and sea requirements went into effect. All US Citizens over 16-years of age must present a valid passport to travel outside of the country, even by car or boat. Exceptions include kids under the age of 16 who can present an original or copy of their birth certificate or other proof of citizenship to travel by land or sea to Canada, Mexico, Bermuda and 17 Caribbean nations. Teens between the ages of 16 and 18, when traveling with an organized group, can follow the same procedures as younger children. If not with a group, they, as all adults, will need their own passports. The latest information about Air Travel for U.S. Citizens is outlined here. However, as of August 2008, a new document is available: a U.S. Passport Card. This wallet-sized document — only good for land and sea cross-border travel between the U. S. and WHTI countries — utilizes a vicinity-read radio frequency identification (RFID) chip to give DHS officers access to biographical information before the traveler reaches the inspection booth so that inspection can be facilitated. Read more about how to use the U.S. Passport Card instead of a Passport. According to the DHS, “for privacy protection, no personal information is stored on the electronic chip itself.” The card is not valid for international travel by air, and your kids will never relish seeing visa stamps accrue on this document, but it only costs $45 for first-time adult applicants and $35 for children under 16. Adults who currently have valid passports can apply for the passport card by mail for $20; visit https://travel.state.gov/ for applications and information. Enhanced Driver’s License (EDL): Several states and Canadian provinces are issuing this driver’s license or identification document that denotes identity and citizenship. It is specifically designed for cross-border travel into the U.S. by land or sea. Trusted Traveler Program Cards: NEXUS, SENTRI or FAST enrollment cards can speed your entry into the U.S. and are issued only to pre-approved, low-risk travelers. The cards are valid for use at land or sea; the NEXUS card can be used in airports with a NEXUS kiosk. Special Groups: Information for Children, Groups of Children, Native Americans, “Closed Loop” Cruises, U.S. Lawful Permanent Residents, U.S. Military, Merchant Mariners, Ferries and Small Boats, and Boaters. Note that the DHS has spared the cruise industry: U.S. citizens on closed-loop cruises (cruises that begin and end at the same port in the U.S.) will be able to enter or depart the country with proof of citizenship, such as a birth certificate and government-issued photo ID. Children under 16 will be able to present either an original or a copy of his or her birth certificate, a Consular Report of Birth Abroad issued by Department of State, or a Certificate of Naturalization issued by U.S. Citizenship and Immigration Services. However, passengers may still be required to present a passport at certain ports of call, so check with the cruise line to ensure your family has the appropriate documents. And, as it has always been, American citizens of any age traveling outside the WHTI zone to any other country in the world must present a passport. With several programs in effect and more changes to come from the WHTI, we recommend you begin applying for an old-fashioned, multi-use passport right now. 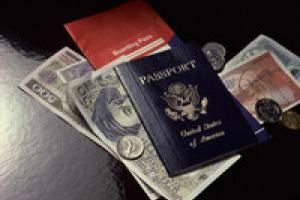 Click on this link for more information on applying for a U.S. Passport for adults and children. To learn more about the US-Visit program read FTF’s special report, “Coming to America”. And some more good news to facilitate air travel: the TSA completed expanding its Family Lane concept to every security checkpoint in America. These lanes allow families, individuals unfamiliar with air travel procedures and travelers with special needs to go through security at their own pace. Individuals carrying medically necessary liquids, aerosols and gels in excess of three ounces will also be directed to these popular lanes. Officers manning these dedicated family lanes will use their training and explosive detection technologies to work with passengers to quickly and efficiently complete the screening process. Individuals traveling with medically necessary liquids, gels and aerosols like baby formula, insulin, cough syrup, contact lens solution and prescription medications will undergo additional screening that will usually take less than two minutes to ensure these items do not pose a threat.